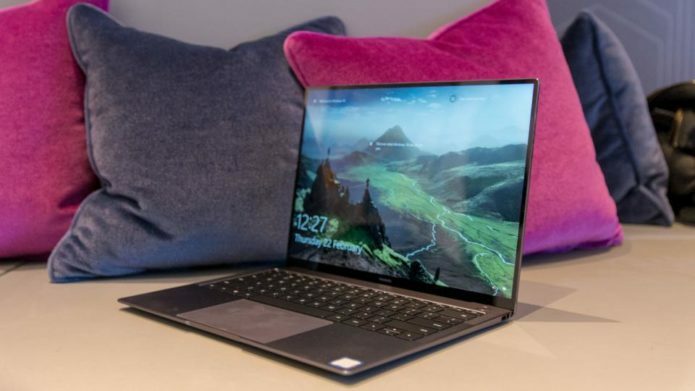 Last year’s Huawei Matebook X was very nearly a MacBook killer. The first Windows 10-equipped laptop from the Chinese smartphone giant, the Matebook X was a superb first effort, cramming a 13in laptop into what was, essentially, a 12in form-factor chassis. It helped that it also looked great, battery life was top notch, and the screen was sumptuous, too. But, despite its positive fanfare on launch, it was a device that was largely forgotten about amidst a flurry of XPSes and MacBooks. Huawei however, is back with the MateBook X Pro, with a slightly tweaked design, faster internals and a couple of other, slightly less-obvious features. Open the box, have a good feel, and there’s one thing you’ll notice straight away. Where are the Matebook X Pro’s bezels? Well, while last year’s non-Pro variant’s bezel-free design was superb, this year’s effort goes one step further, with a massive screen to body ratio of 91% and a slim 4.4mm bezel all the way around the display. What this means is that, well, this laptop is completely dominated by its massive, 14in LTPS screen. It looks even better than Dell’s XPS 13 and its InfinityEdge panel, that’s how good this is. With this all-display front, you might spot that something is missing. The bezel is so thin that there’s simply no room for a webcam. Instead, it’s “hidden”, nestled between the F6 and F7 function keys. Simply press down on it lightly, and the key pops up, revealing the webcam – almost like the hidden headlamps in old sports cars, or that alien that pops out of the desert in Star Wars: The Force Awakens. Elsewhere, the Pro’s aluminium chassis is lovely. In fact, it’s even lovelier than the original MateBook X’s, with sandblasted grey and silver chassis colours, and shiny diamond-cut chamfered edges. It’s absolutely gorgeous, and weighs only 1.33Kg, too. You aren’t left lacking when it comes to ports, either. In terms of physical connectivity, you’ll find two USB Type-C ports – one is Thunderbolt 3 enabled – and a 3.5mm headphone jack on the left edge. The right side houses a full-fat USB Type-A port. Circling back to that massive screen, we’re treated to a 14in LTPS display with a resolution of 3,000 x 2,000 pixels, a pixel density of 260 PPI, ultra-wide viewing angles, 1,500:1 contrast ratio and, Huawei claims, 100% sRGB coverage. And, it certainly looks nice on first impressions. The Matebook X Pro also supports Dolby Atmos audio, just like last year, and comes with a speaker in all four corners. At launch, the Matebook X Pro will be available in two different configurations. The first features an Intel Core i5-8250U with 8GB of RAM and 256GB of SSD storage. The second is far beefier, with an Intel Core i7-8550U, 16GB of RAM and a 512GB NVMe SSD, complete with discrete Nvidia MX150 graphics. Elsewhere, Huawei claims the X Pro’s 57.4Wh battery will last you an entire day on a single charge, thanks to its new power management software that boosts the new machine’s power efficiency by 15%. And, thanks to the USB Type-C fast charger, the Matebook X Pro can supply six hours of charge after just 30 minutes of charging from zero. Huawei’s Matebook X Pro is certainly something special, but that was never in question if last year’s laptop was anything to go by, was it? Whatever you thought about Huawei’s last attempt, this 2018 re-do is better in almost every respect: it’s faster, has a great, bezel-free display and, well, it looks seriously good, too. However, Apple’s MacBook still holds the crown in the ultraportable category, and it’s a reign that would be difficult to upheave. One thing’s for certain, I can’t wait to find out if the Matebook X Pro can do it.